The School of Electronic Engineering and Computer Science is delighted that Professor Arumugam Nallanathan, Professor of Wireless Communications at the School, received the Best Paper Award for his paper ‘Energy Efficient Resource Allocation for Secure NOMA Networks’ at the Spring IEEE Vehicular Technology Conference '2018 (VTC'2018). NOMA (Non-Orthogonal Multiple Access) is a topic which has attracted much recent attention and it will likely play an important role in the fifth-generation (5G) mobile communication networks. NOMA improves the information rate that can be transmitted over a given bandwidth in wireless communications, which means that networks in future will be able to meet the increased demand for data from mobile users and deal with the explosion in data traffic. 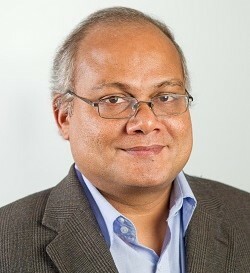 At a time when reducing energy consumption is key to containing the threat of global warming, Professor Nallanathan has discovered a method of improving NOMA’s energy efficiency, solving a problem that could have challenged or prevented the use of NOMA in future 5G networks. The paper is co-written with H. Zhang, N. Yang, K. Long, M. Pan, G.K Karagiannidis. Selected out of 500 submissions, the award is recognition of the outstanding research on current hot topics in wireless communications that Professor Nallanathan and his colleagues are engaged in.